All DLCs from the Xbox 360 version are included, including the bonus missions that were locked away as a separate purchase for the international releases; these missions however must be unlocked by meeting certain conditions. Available as DRM-free or Steam key, not both. DRM-free version does not have achievements or access to online leaderboards. BulletWitchLangauge found in <path-to-game>\savedata stores language settings. 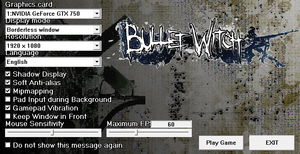 BulletWitchSaveData and BulletWitchSystem are the game's save game data files. BulletWitchRecord stores mission score data. On by default with no option to disable. 30, 60, 120, or Unlimited. Adjusted from the configuration tool. 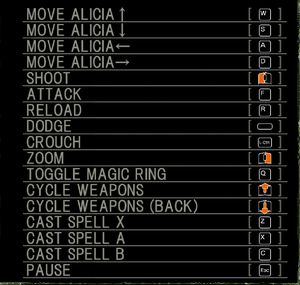 Mouse wheel can be used to navigate the menus, while left and right mouse buttons act as Confirm and Cancel respectively. Configuration tool requires mouse input, but it can be disabled afterwards if desired. Movement and aiming are bound to left and right analog sticks respectively, and cannot be remapped. No vibration support (tested on V2 controller). Some HUD elements still have Xbox buttons prompts. For Japanese audio, use the unofficial Japanese Voice Pack. This is caused by the engine incorrectly overpolling the USB I/O in Windows in keyboard and mouse mode. Issue does not arise if the game detects a gamepad plugged into the system. Keyboard and mouse can still be used to play the game as long as a gamepad is present. This may be complicated on Windows 7 and earlier due to Xinput support issues. Open the Start screen/Start menu, type devmgmt.msc and press ↵ Enter. Select "Human Interface Devices". Disable all "HID-compliant consumer control device" and "HID compliant device" ("HID compliant vendor defined device" in Windows 10), you should not need to disable anything else. It is advised to re-enable the devices after the game has closed. 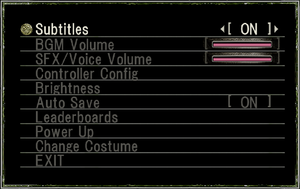 Mimimum requirements are based on the game running at 720p at 30 FPS. ↑ 2.0 2.1 File/folder structure within this directory reflects the path(s) listed for Windows and/or Steam game data (use Wine regedit to access Windows registry paths). Games with Steam Cloud support may store data in ~/.steam/steam/userdata/<user-id>/696180/ in addition to or instead of this directory. The app ID (696180) may differ in some cases. Treat backslashes as forward slashes. See the glossary page for details. 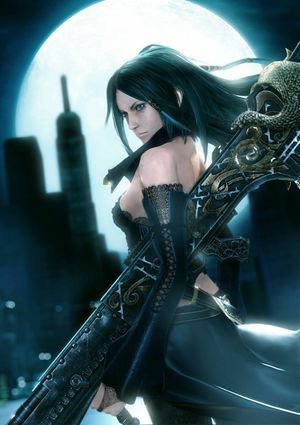 "In Japan Cavia released extra costumes and bonus stages, entirely for free on XBL. 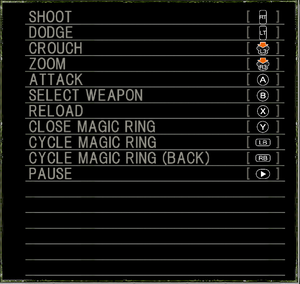 This consisted of: six stages with unique goals, such as defeating a certain number of hidden enemies or reaching an area unscathed. Remixed versions of five regular levels, titled Extra Edition, which made them more difficult. Finally, the ability to play any of the standard levels with the most powerful magic, which you’d normally only receive near the end. A total of 17 micro downloads. What Atari did was then charge for them in the Western release. Admittedly they’re only 20 points ($0.25) each, meaning it’s 340 points ($4.25) for all DLC, but still, it’s the principle of the matter." Used a Logitech F310 in DirectInput mode and the game registered input from it and used the configuration from my Xbox One controller.